Someone in TJ's marketing department was paying attention during vocab. The word "convivial" just means friendly, agreeable, or enjoyable. I've only heard it used once or twice in my whole life during casual conversation, but hey, it adds to the alliteration in the title of the product. And alliteration is clearly convivial to the cochlea, don't you concur? Leave it to Trader Joe's to combine trains, friendliness, and random cookies from Germany with very European-sounding names in a way that doesn't make any sense...and yet still there's this inexplicable impression that they know what they're doing. It worked on us, right? And we've no major complaints about this product, either. When they say 24 cookies in the box, it's not a trick in this case—unlike their five-ounce tuna cans and bags of "about" 40 churros. 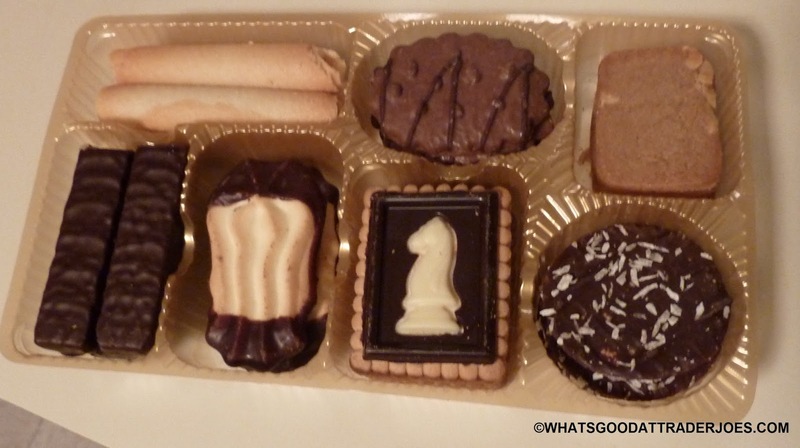 Each type of cookie is pretty good, although there were definitely some I liked better than others. I liked the crispy cylindrical cookies the best. It might have been my overactive imagination, but they had an almost citrusy, lemony essence about them. A close second for me were the Kit Kat-esque wafers covered in dark chocolate. I might have liked them even more if they were covered in white chocolate, but the dark kind worked just fine in this case. I'd also say the same about those butter cookies with choco-fied edges. Those were my third favorite. In fact, if you look at the picture, Trader Joe's conveniently laid out the cookies from left to right in the order that I like them. Overall, Sonia liked the cookies even more than I did. 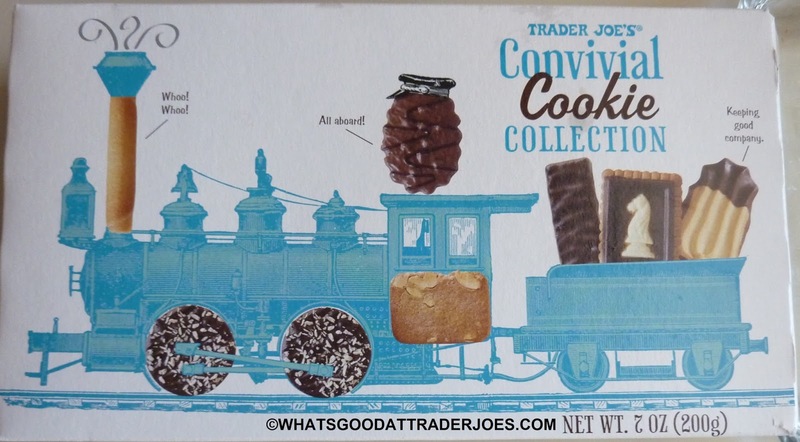 Plus, she was a huge fan of the nonsensical train-themed packaging and clever quips spoken by the cookies, like when the circular coconut cookie says, "I'm always around" on the back of the box. Her favorite cookie is the one with the knight from a chess set on it. Sure, the knight is made of white chocolate, but there's barely enough to taste it at all, especially considering it's surrounded on all sides by dark chocolate. She liked that there were seven different cookies to choose from, and that when you tired of one kind, there were still others to try. She gives this product four stars. I can't get super excited about the packaging in this case, and I'm not really the biggest dark chocolate-covered cookie guy in the world, but I must admit that for $3, these are high-quality selections of confections. Three and a half from me. I thought it was "carnival collection". 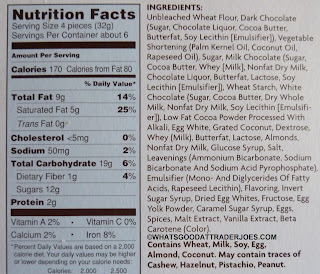 Why they didn't do a cookie butter filled cookie selection? The tube cookie should be filled with cookie butter. If they are from Germany they don't know about cookie butter...lol. Too bad for them. And no offense but being European there is no such thing as white chocolate. 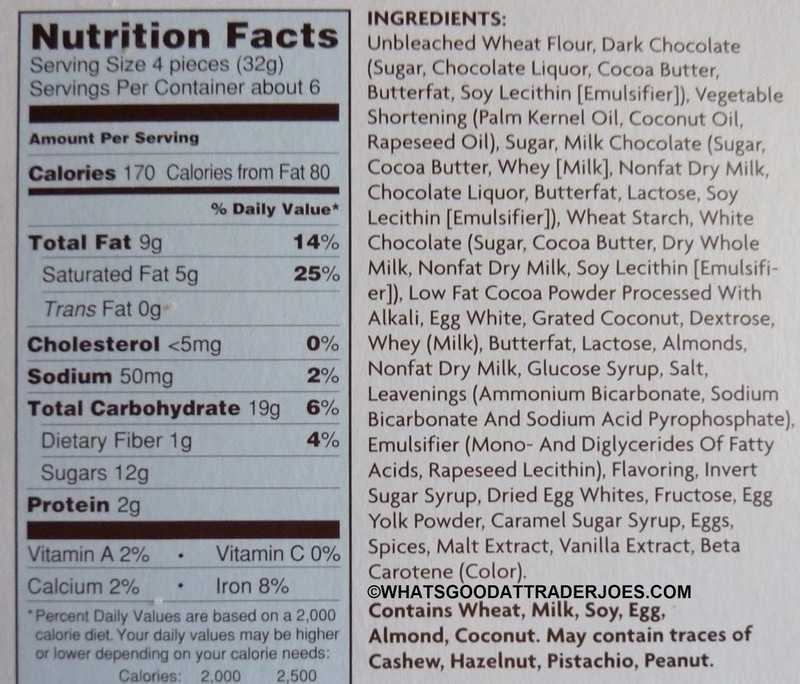 It is not "chocolate" per say-its milk, vanilla, sugar, cocoa butter and lecithin...more of a coating. Personally, I don't like it very much. I prefer dark chocolate but I can understand how some people might like that milky vanilla taste. These cookies do sound yummy. Oh I'm well aware I'm part of a distinct minority on the white chocolate issue :) It seems to be so unpopular, I'm surprised it still exists at all! Looks to me like another Pepridge Farm knock off. I loved it!